It’s that time of year again! 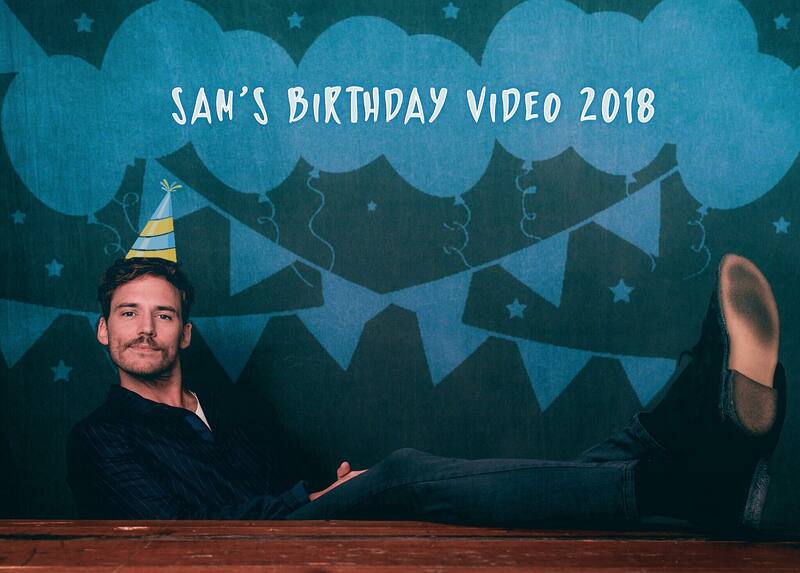 Time for our annual birthday video message to our fave guy If you are a new fan of Sam or a new follower of ourselves, you may not have seen last year’s video message to him. 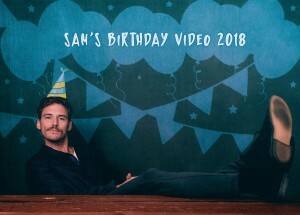 Sam really appreciates his birthday video wishes and has shown his appreciation for them for the past six years! If you do not speak English, you can just add subtitles or send them! Happy happy birthday to our fave guy! Today is his 31st birthday! And he managed to miss the full thing! No joke – as he was due to fly from the US where he was currently, over to Fiji where he was about to start filming Adrift opposite Shailene Woodley, and due to the time zones, he managed to miss the 27th completely! Whoops! 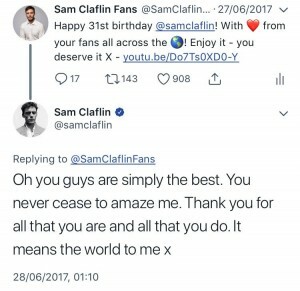 As always, we sent him our birthday wishes as soon as the clock struck Midnight on the 27th June Thank you to everyone who took part as always! If you haven’t seen the video, you can catch it below! 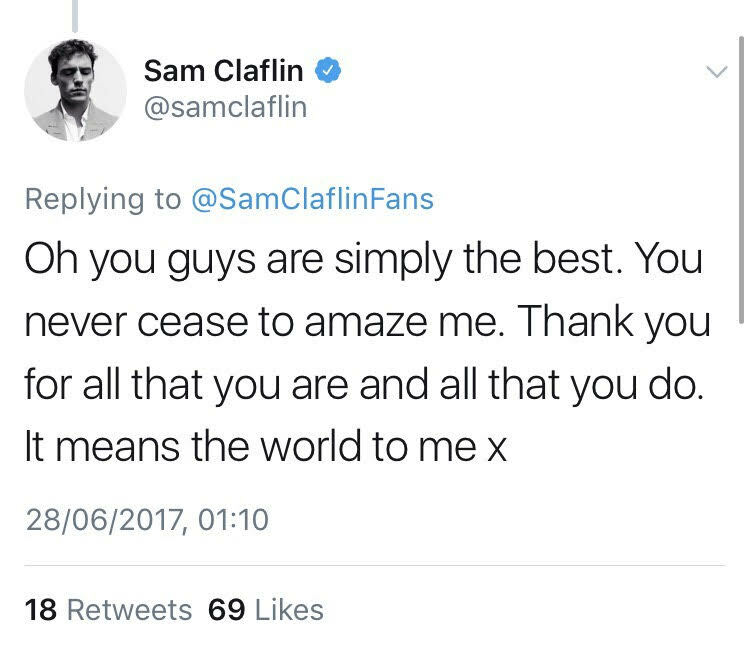 Sam saw the video a little later on (after arriving in Fiji) & sent this lovely message (below) in thanks. Once again, thank you to everyone who took part – you can see how much this means to him And huge thanks, as always, to our video editor @jonnyhadapigeon for doing a marvelous job as always! 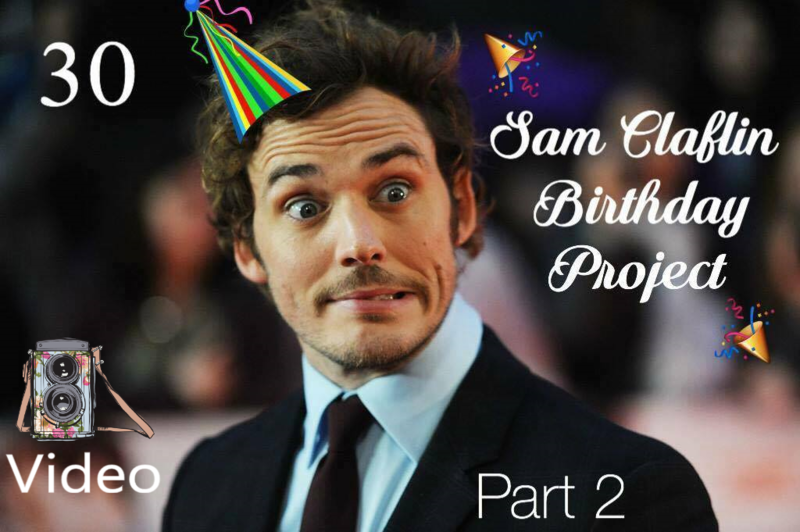 Sam’s Birthday Project 2017 – Video! 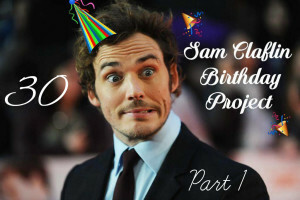 Due to time restrictions, we have chosen not to do a birthday book to Sam this year. And for those of you wondering about last year’s book – sadly it still hasn’t reached him from his agents yet As soon as we have any info about it we will be sure to let you know! So for now, it’s all about the video! Deadline to get your messages into us by is Sunday June 18th. Good luck, have fun & we look forward to seeing your lovely wishes for Sam! Happy Happy Birthday to our favourite guy! 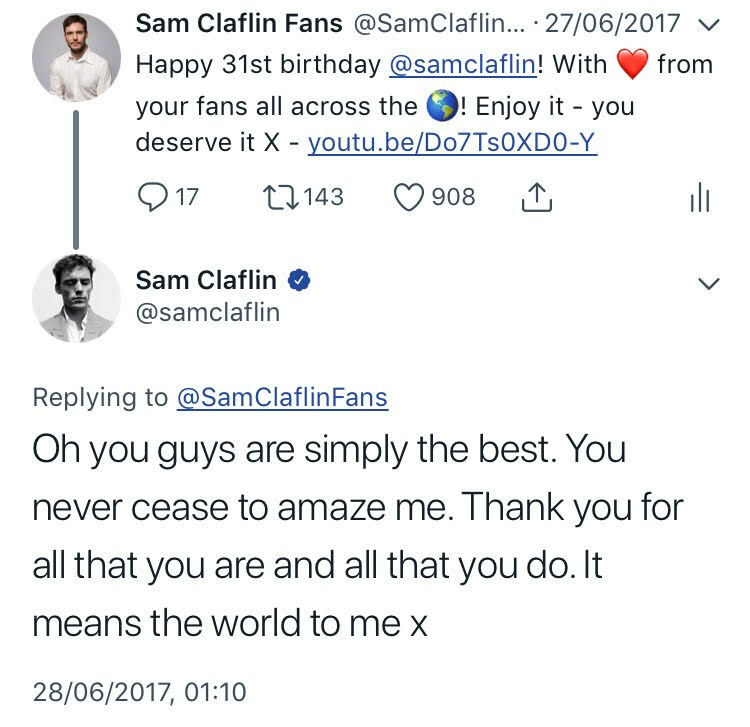 Today Sam turned the big 3-0 and fans from across the world came together to wish him the happiest of days. Thank you so much to everyone who took part in the birthday video for him & if you haven’t yet seen it then check it out below! 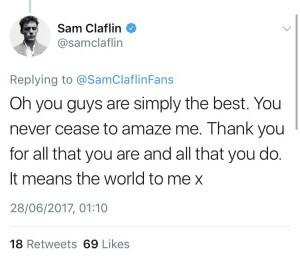 For those of you wondering about the scrapbook it has now been sent to Sam’s agents & as soon as he recieves it we will be sure to post some photos – obviously we need to keep it a surprise for him until then! Birthday Project Part 2 – Video! Deadline to get your messages into us by is Sunday June 19th. Good luck, have fun & we look forward to seeing your lovely wishes for Sam! 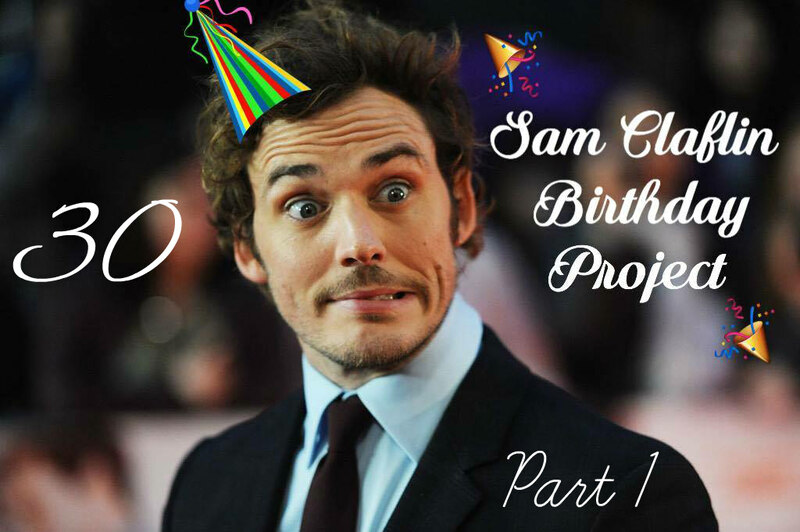 We would also like to say a big thank you to you all for your lovely messages for Part 1 of the Birthday Project – we will be taking lots of photos as the scrapbook comes together & will post some when Sam receives the book (of course we have to keep it a surprise for him until then!). It’s that time of year again! 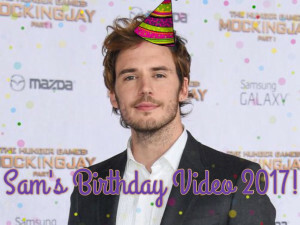 Time to start wishing our fave guy a happy birthday! And this year…it’s the big 3-0! 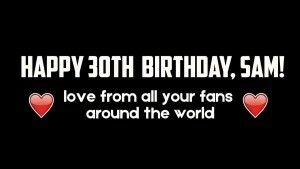 We know that there is still a while to go before his actual birthday on June 27th, but as you know from last year, the process of putting something special together takes time, and the more time we have the better!